This year, most states will go into legislative session to consider changes in public policy. State advocates will work strategically to support decarceration reforms. Recent coalition efforts have moved issues through state legislatures with substantial momentum in support of collaborative advocacy to challenge mass incarceration. Since last November, momentum to expand voting rights to person with felony convictions has gotten stronger. In Florida, voters overwhelmingly supported the 2018 ballot measure estimated to restore voting rights to up to 1.4 million Floridians with felony convictions. Since the success in Florida, lawmakers and advocates in California, Iowa, Minnesota, New Mexico, New Jersey and Kentucky have advanced proposals to restore voting rights. Supporting a broad coalition regardless of political affiliation has been important to rights restoration efforts and has helped advance state reforms. Advocates in Kentucky, Nebraska and Louisiana have worked with the American Probation and Parole Association to demonstrate law enforcement support. The APPA supported legislative proposals in Kentucky and Nebraska while filing an amicus brief in Louisiana that challenged that state’s voting restrictions. State coalitions have successfully strengthened reentry policies in recent years. One policy goal has scaled back the federal lifetime ban on food or cash assistance for persons with felony drug convictions. Lawmakers in Alabama, Louisiana, Georgia, Missouri, and Texas enacted recent efforts to expand safety net programs. Currently, lawmakers in South Dakota, Virginia, and West Virginia are considering similar proposals. Faith leaders have partnered to improve reentry by expanding access to safety net policies. Missouri advocates connected with local churches to influence legislators with constituents who support food assistance for justice-involved residents. Texas advocates successfully worked with a Catholic leader to publicly support a similar reform. State strategies to end life imprisonment are gaining momentum with advocates and lawmakers considering reform proposals around the country. Many state advocates have highlighted the recommendations advanced by legal scholars with the well-regarded, nonpartisan American Law Institute in support of “second look” provisions to address long prison terms. The ALI recommends that a “judge or judicial panel revisit the sentence of any prisoner who has served 15 years or more in prison, and decide if, under present circumstances, the sentence originally imposed or a different sentence better serves the purposes of sentencing.” This year, state coalitions are championing “second look” provisions in New York, Pennsylvania, and Texas. Nicole Porter speaks on ending life imprisonment at Release Aging People In Prison Campaign rally in New York. Arizona – Lawmakers are considering legislation that revises the state’s truth-in-sentencing requirement from 85-percent time served to 65-percent time served for certain offenses. California – Advocates with the Free the Vote Coalition launched a campaign for a 2020 ballot initiative to restore the right to vote to all people on parole. Kentucky – The League of Women Voters of Kentucky published Felony Disenfranchisement in the Commonwealth of Kentucky. The report recommends a constitutional amendment restoring voting rights to persons with past felony convictions. New Jersey – Gov. Phil Murphy supported expanding voting rights to persons with felony convictions. New Mexico – Lawmakers are considering legislation to expand voting rights to all residents with felony convictions including persons who are incarcerated. 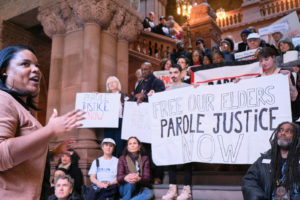 New York – Advocates organized a parole justice lobby day in support of improving release outcomes for incarcerated elders sentenced to parole-eligible life sentences. South Carolina – Policymakers are considering a comprehensive sentencing reform measure that would revise the state’s truth-in-sentencing law from 85-percent time served to 65-percent time served for qualifying offenses. West Virginia – House lawmakers approved legislation to end the lifetime federal ban on food assistance for persons with felony drug convictions.